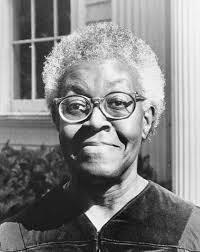 I had the pleasure of seeing Gwendolyn Brooks on more than one occasion at Chicago State University. She was a professor there at the same time that I had a teaching stint. I attended the reception when they opened the Gwendolyn Brooks Center for Black Literature and Creative Writing named in her honor. Several dignitaries were present and I remember having a brief chat with the illustrious historian, Lerone Bennett. It was a jovial, low-key, yet gala affair as people stood around talking and nibbling on light snacks. Of course, she was there with her ever-present smile. I also saw Gwendolyn Brooks at a couple of literary conferences which were held annually on the campus. At another event, those of us who were in a modern dance class danced and she read poetry. It was a very memorable day. 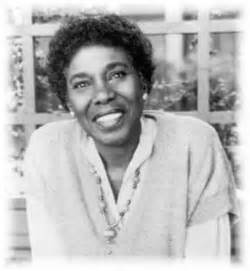 Gwendolyn Brooks had a smile that could light up any room and I never saw her look cross or unpleasant. She seemed to give life the light touch and there was this subtle, gracious aura surrounding her each time I was in her presence. Isn’t that a nice thing to be able to say about someone? Gwendolyn Brooks was awarded a Pulitzer Prize for Poetry in 1950, becoming the first African-American to be granted this honor. 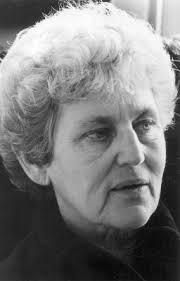 She was also became Poet Laureate of Illinois in 1968 and held that title until her death in 2000. And, she was appointed the Poet Laureate Consultant in Poetry to the Library of Congress in 1985. As a Poet Laureate her role was to ‘promote citizens’ awareness of poetry as well as heighten their appreciation of the art form. The Laureate strives to forge a meaningful communion between poetry and the state’s populace (Illinois Poet Laureate). There is also high school named for her on the south side of Chicago. Most Chicago school libraries house a copy of her book, Bronzeville Boys and Girls. Most of them are tattered and worn from use and often in need of replacement. I was happy to replace our school library’s copy for a new, fresh and colorful one. Her poem, We Real Cool, holds the most meaning for me. It can be found in many literary anthologies. Ms. Brooks said that she had seen a group of boys in a pool hall on the corner of 79th and Cottage Grove on Chicago’s south side and was inspired to write this poem. Anyone who knows Chicago, also knows that this is a corner of high activity. Only a poet can say so much in so few words. It speaks volumes! I am so glad that I had the opportunity to hear and see Gwendolyn Brooks in person. What a perfect way to end my tribute to our Women Writers during Women’s History Month and open the door for the poets of April’s National Poetry Month! I first encountered Tillie Olsen’s writings in a college literary anthology. This is a great format for writers because they are introduced to young thinkers as they go through their college studies. Writers never know which young impressionable minds might be digesting their works. Consequently, Tillie Olsen’s story, I Stand Here Ironing presented a writing technique that I have not forgotten. She creatively shows a mother ironing clothes and reflecting on her concerns about her first-born daughter. She is concerned about her daughter’s welfare as she takes responsibility for her daughter’s disconnect. I found this format unique because Tillie Olsen took something that we all do everyday and simply recorded it. We all clean and do daily chores while our minds rehash events and portions of our lives. The title itself is a great attention-getter. 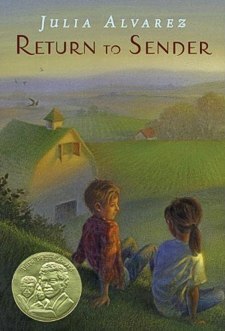 The story takes place during the Great Depression. The timing alone sets the tone for feelings of despair as many people were feeling during that time. Good writers know certain eras are characters in themselves. The mother irons as she tells the story of her daughter Emily who is now 19 years of age. She was a beautiful, bouncy dark-haired child and the mother raised her by the books. But to the family’s dismay, the father felt that he could no longer cope and he abandoned the family. The mother is forced to take on extra work to make ends meet and Emily is left with babysitters and sometimes with the father’s family. It is every mother’s greatest guilt. The mother admits that Emily looks like the father and she privately wonders if she has shown her ample affection. Emily becomes ill and frail and is not gaining weight and she is sent to a sanatorium. Her mother writes her regularly but Emily is not allowed to keep her mother’s letters. They can only be read once and then they are taken to be destroyed which adds to the child’s insecurity. When Emily does return home, the mother fears that she is forever scarred. The mother remarries and more babies are born. In fact, there are four more children and when the stepfather goes away to war, Emily becomes a second mother to her siblings. Unfortunately, Emily and her younger sister, Susan, have this ongoing conflict and only a mother’s love can fully understand this rivalry. Susan is a curly- haired blond who is bubbly and very much-loved. She is a stark contrast to Emily when she was a small child. I replicated this technique in a short story that I wrote called How? It can be found in a collection called Traveling Streams. I would like to thank and honor Ms.Tillie Olsen during Women’s History Month! Her creative writing technique has inspired many and this short story has been made into a short film! 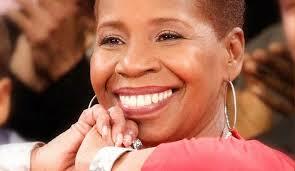 Iyanla Vanzant spoke at my church years ago. I was at a crossroads and wasn’t sure of my direction, but after hearing her speak, I knew exactly how to move forward. I purchased a ticket for a long desired trip and during that flight, I was able to put a lot of things into perspective. Her books have had that same effect on me. Ms. Vanzant teaches contentment and patience. In her books The Value in the Valley and In the Meantime, she reminds us that we are always garnering the fruits of our labors. She advises us to remain industrious even during the downtimes. She says that we should stay busy and productive using the gifts that we do have as we wait for our big breaks to come along. Vanzant tells us to use some of our latent skills, if our major ones are not in demand at that time. We multi-faceted people and we have a lot to give in so many other areas. I have learned so much from reading her works and her messages were not lost on me. She writes that we should get quiet, really listen and see what we are to learn from what we call challenges. Challenges are really flip-sided blessings. We may have to brush off some skill that we have not used in a while to make ends meet. And, in turn, we may find that we have discovered a new oyster to add to our collections. My absolute favorite book by Vanzant is Acts of Faith. It is one of the most spiritual books that I have in my collection. She said that she was amazed by it as well. I recently gave it to a co-worker who looks at Vanzant on television. I wanted her to have some of Iyanla Vanzant’s printed words to study and ponder. Acts of Faith is a daily guide which starts off with a quote by a famous person. Then, Vanzant gives her lesson on that theme. It goes through all 360 days of the year, but any page that it opens to will be the right page. There are no disappointing messages in this little gem. Each day closes with an affirmation on the subject for the day. It’s the type of book that you buy over and over, because you are likely to meet someone who needs it more than you. So, you gift it and buy a replacement copy. Congratulations to this inspirational and gifted sage during Women’s History Month. Thank you Ms. Iyanla Vanzant for taking me even further on my journey! When I was a Battle of the Books coach, I read Julia Alvarez’s book called Return to Sender. She calls herself a Dominican Republic writer, though she was born in New York City. Her native Dominican Republican parents took the family back to the DR when she was a small child and she spent the first ten years of her life there. So, she has the benefit of writing about both places. In her book, Return to Sender, a Mexican family moves onto a dairy farm in Vermont. They are migrant workers and have been hired to assist the Vermont family after the father has had a tractor accident. The story is partially told through the eyes of Tyler who is in the sixth–grade. His family owns the farm. The migrant family, the Cruzes, include the father, his three girls and two uncles. The mother is noticeably absent from this family. The oldest daughter, Mari and Tyler become friends. They are in the same classroom and they spend time looking at the stars at night through Tyler’s new telescope. Both Tyler and Mari simultaneously narrate the story. Mari’s portion is done through letters to her absent mother. The reader discovers that a coyote, a person who assists Mexicans across the border, has kidnapped the mother. They want a ransom from the Cruz family and they go into crisis mode as they try to raise the money to free Mari’s mother. This book had me on the edge of my seat. I was unaware of how much fear these undocumented workers deal with on a daily basis. It was educational for Tyler, for me and my students. The Cruz family came out okay later but this story was such an eye-opener. Hats off to Ms. Julia Alvarez for writing such a riveting tale! Ntozake Shange is widely known for her dramatic piece called, For Colored Girls Who Have Considered Suicide When the Rainbow is Enuf. Whew! What a mouth full. I saw it staged in Atlanta and I recently saw the movie version on television. But to me, her greater work is Sassafrass, Cypress and Indigo. This is one of my all-time favorite novels. It has an eclectic flavor where she uses text, poems, recipes, letters and chants as she tells this story about three sisters who are weavers of cloth in Charleston, South Carolina. I was raised in a family of all girls so I really identified with this book. The mother, Mama, is the central force as she guides and steers her girls in the right direction. She is a widow, but the father’s strong influence can still be felt in the home. There is a down-home feel to this book as we see a lot of cloth strewn around and smell good aromas coming from the kitchen. Sassafras is the oldest; Cypress is in the middle and Indigo is the youngest. Each sister has a different personality and we get to know them as their stories and experiences unfold. The oldest sister, Sassafras leaves home and travels west. She gets involved with Mitch, who is abusive and can’t deal with hearing any parts of the truth. The mother continually guides her through letters and she hopes that Sassafras will leave the situation. Cypress is a dancer who leaves Charleston and goes to New York to join a dance troupe. She parties all of the time, likes to cook and seems to go through relationships like water. The mother feels that Cypress is making poor choices and wonders if she will turn out well. Indigo still lives with the mother and knows the concerns that the mother has for her sisters and their lifestyles. She still talks to her dolls but she listens to the teachings of the older members in the community who help her see life from a different point of view. Indigo remains more grounded in her choices and her attentive aunt also teaches her a lot about life. Aunt Haydee, a healer and a midwife, graciously prepares Indigo for some roles that will greatly benefit her later in life. This is a beautiful story. I re-read it recently and that is rare for me. 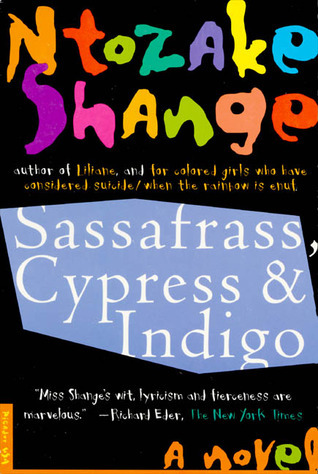 Ntozake Shange’s technique of using a variety of art forms influenced my decision to do the same in my novels. I also mixed text with poetry. I would say pick this one up. You will laugh. You will cry. You will sigh. And, you will probably write down quite a few recipes along the way. I have high regards for this wonderful writer, poet and playwright. 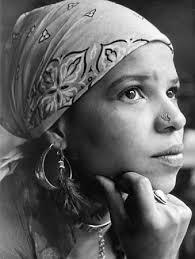 Kudos to Ms. Ntozake Shange during Women’s History Month! Marilou Awiakta is a Native American writer, essayist and poet whom I met and enjoyed conversing with at a gathering at the University of Memphis. I remember her because of her warm and gentle presence. She shared many things about her culture and some of her pearls of wisdom were used in my first novella, A Golden Leaf in Time Revised. She is an Eastern Band Cherokee and she told us about her community and assured us that they were no different from others. Her tone was light and humorous as she spoke about the Indian community. I remember her. Ms. Awiakta said that the women are extremely important to the decision-making process in their tribal communities. Of course, we liked hearing that. They have always been invited to sit in on the governing bodies’ meetings because it is understood that they bring balance and calm during times when grave matters are being discussed. The women’s opinions are highly regarded because women are more likely to look for peaceful solutions. They are maternal in nature and will do all that they can to avert a war. They keep the safety of the children in the forefront of their minds. What a wonderful qualifying trait for women as we honor them during Women’s History Month. At the end of her session, she showed us a peace ritual, which I ended up using in my book. We stood and raised our hands in the air. We repeated the words, “Out of ashes my will rise,” and faced all four directions – north, south, east and west. My main character, Phoenix, used this practice in A Golden Leaf in Time Revised as she tried to reassure herself that things would get better in her life. Awiakta wrote, “When the people call Earth ‘Mother,’ they take with love and with love give back so that all may live.” We all have a responsibility to preserve and protect the earth and each other. In her books, she blends stories, essays and poetry. Her books include Selu: Seeking the Corn-Mother’s Wisdom and Abiding Appalachia; Rising Fawn and the Fine Mystery She lives in Knoxville, Tennessee. A simple meeting can leave a lifetime impression as Marilou Awiakta did on my life. Thank you, Ms. Awiakta and Happy Women’s History Month! When I was in fifth grade, my mother was our school librarian. That was very helpful because that was the year that I dealt with a lot of bullying. Somehow, we never forget those pains as another Twitter writer and I agreed during an interview. I would receive my note right before recess, which stated, “We are not playing with you today.” I took a deep breath, faced the mean girl behavior and I went to the library and read. Eleanor Frances Lattimore, along with those little blue biographies, kept me entertained and served as my lifeline during that pivotal year. Lattimore wrote and illustrated more than 50 children’s’ books and they were mostly about children in China. Peach Blossom and Lee Ling became my friends. Her books transported me to another time, location and culture. As I read her stories, I felt as if I was walking down a street in China. I could see, feel and hear the sights and sounds of the movement in the city as the girls went about their daily lives. Lattimore is better known for her Little Pear stories and I was able to buy Little Pear and Friends through Amazon. I recently shared his stories with the children in the library. They often asked me when I would read more about Little Pear. He was a mischievous little boy who got in trouble for things like trading his two month-old baby brother for an older child who could walk and talk. The tales are light and humorous and they always turn out well in the end. The children laugh as they listen to the read-alouds about Little Pear. Eleanor Frances Lattimore was born in Shanghai, China to American parents. She was one of five children. Two were born in Washington D.C. and the other three were born in China while their father worked as a professor of English at a Chinese university. She later returned to the states, married and lived in North Carolina. She spent many years in China as a child and wrote about Chinese children. I am grateful to Ms. Lattimore for writing those stories because they served as a great diversion for me. We all have millions of stories in our heads, but to actually take the time to sit down and write those tales takes a high level of commitment and skill. Writers never know what child or adult’s life they might be saving by merely putting pen to paper. So, during this Women’s History Month, I would like to sincerely thank Ms. Eleanor Frances Lattimore! What can be said of Paule Marshall? I was working at a bookstore in the 80’s and I saw this new book with a distinguished-looking woman of color on the cover. I thought, “Wow. What is this about?” We were allowed to borrow books as booksellers, so I anxiously wrote down my name and took it home. 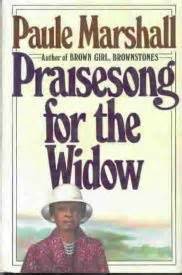 It was called, Praisesong for the Widow. It was timely because I was living with my mother again, who had recently become a widow. This book took me on an unforgettable trip. Avey Johnson, the widow, needed a deep cleansing and healing after losing her husband of many years. She contemplated a European trip but after consulting her youngest daughter, she and a friend ended up going to the Caribbean, instead. She put down her pretensions and really felt the earth move beneath her feet. She looked back over her life, her marriage and her role as a mother. For a short time, she left all of those roles behind and felt like the young woman she had once been. She wandered out into the rural parts of the village and ended up participating in a healing dance with the other elders. They shuffled their feet to shake off of life’s pains. She returned to the States with greater clarity. She decided to work with the youth in the community and hopefully guide them into making positive choices. Fortunately, I was able to meet and chat with Paule Marshall at a literary event. I told her that I had taught her novel to a college class. Her eyes lit up and just as we were about to talk, we were interrupted. Oh well, it is called life in the big city; but her reaction was enough to let me know that she was pleased that her book had been selected. 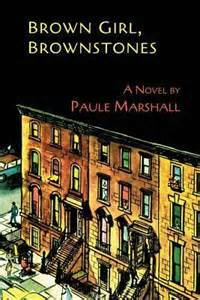 Her other novel, Brown Girl, Brownstones, centered around the trials of a West Indian family that lived in Brooklyn. The daughter, Selina Boyce, resented her mother because she held her responsible for the horrible demise of her father. As immigrants trying to assimilate into society, they worked very hard to raise their social-economic status and to purchase the sainted brownstone. While the mother worked very hard, the father continually came home smelling like other women’s perfume. She got tired of his escapades and had him deported. One would have to read the book to see what other shocking things happened to the father. Selina was unforgiving and did not understand her mother’s actions until she started dating herself. Then, she better understood the affairs of the heart. Ms. Marshall’s family had roots in Barbados and her writings give us insight into the West Indian culture and their struggles to become a part of the American fabric. This great storyteller is sure to entertain any reader! Hats off to Ms. Paule Marshall! I heard that author Sandra Cisneros would be reading from her books on the far north side of Chicago. At the time, I was attending a workshop in Gary, Indiana with one of my sisters. I told her about the event and she graciously agreed to drive that distance so I could hear Ms. Cisneros. My sister displayed a lot of spirit and she didn’t mind dealing with the traffic. To me, it would have been unthinkable. But she did drive the long distance and when we reached the bookstore, of course there was nowhere to park. It’s a north side thing! She drove around and around as we looked at the entry to the bookstore. We finally agreed that I should go on in as she continued to look for a place to park. But here is the quencher. After I went into the bookstore, it was so packed. There was standing room only. I could hear her reading, but I couldn’t see her. I wasn’t able to get a glimpse of her arm, hair, nothing. Just her voice! I stood on my tiptoes and leaned both ways. Nothing. After trying that a few times, I went back out and caught my sister who was still circling the block. I let her know that it wasn’t working. And what does that say about a great writer? It shows that she is loved and revered by many who traveled and obviously found parking on the north side of Chicago. And that is no easy feat. 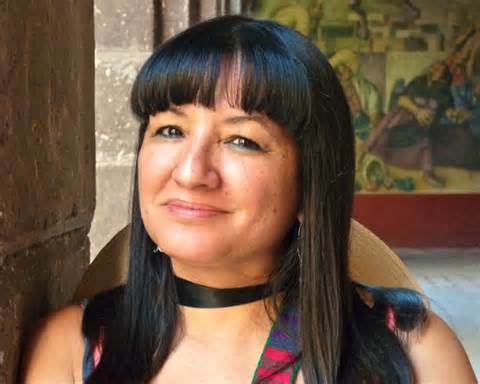 Sandra Cisneros calls herself a Chicano writer and was born in Chicago. Her stories deal with urban life in the Mexican community. I am familiar with The House on Mango Street and Woman Hollering Creek. In House on Mango Street, Esperanza’s family has moved into several apartments on this street. It is considered to be a coming-of-age story. She observes the powerless women around her and she vows that she will make different choices when she becomes a woman. She sees them at the mercy of their husbands and boyfriends and they are unable to function independently. She begins to write and this gives her an outlet as she searches for her own path in life. Her other work, Woman Hollering Creek is a collection of short stories that deal with those living close to the Mexican border. They are regularly affected by immigration. Those women in abusive relationships seek freedom and must cross the border going either into Mexico or to the States. Sometimes, they have to leave children or family behind and there is a place in central Texas called Woman Hollering Creek. It is said that the wails can still be heard there. Different characters tell their stories in this work as they voice their hopes and acknowledge their shattered dreams. We care about each one and we become more sensitive to the pains of those who have to make such hard decisions as they look for a better life. I enjoyed her works and I salute Sandra Cisneros during this Women’s History Month. This post honors the writer, Katherine Anne Porter. When people ask for one of my favorite novels, I always include her book, Ship of Fools. I felt as if I had a private seat on that ship as she colorfully described the passengers. It was a bestseller in 1962. Ship of Fools is about a voyage that Ms. Porter took in 1931 from Vera Cruz, Mexico to Germany. She had plenty of time to observe those in her midst. The ship was filled with people from a variety of ethnicities and cultures and each presented its own memorable story. She accurately described a Spanish nobleman, a group of dancers, a couple of Mexican priests, an American divorcee and a German lawyer, to name a few. They all have one common thread. They are just people who had hopes, dreams and disappointments. Yet, she found some of them to be rather absurd and quite comical. Whenever a writer can make the reader feel like a spectator as the events unfold, then that writer has a gift and talent. Porter said, “Most people won’t realize that writing is a craft. You have to take your apprenticeship in it like anything else.” Photographers share through pictures and painters tell their stories on canvases. But those who are skillful with words create images that take the readers on many adventures. Then, there is her short story, The Jilting of Granny Weatherall. I vividly remember this story. It opens with an older woman who is reminiscing on her deathbed and being attended to by a very young doctor whom she privately resents for being so young. She is looking back over her life and though she has had a good life, she cannot forget when she was jilted or left at the altar as a young woman. As her adult daughter, Cornelia waits on her, Granny Weatherall worries that she has not had time to tidy up some of her affairs. She does not want her children to find her old love letters to both her fiancé and her husband. When George did not show up at the wedding, John stepped in to console her. He became her devoted husband of many years until his death. She has tried to not think about the jilting for 60 years, but now that she has plenty of time on her hands, the painful memories rush in and consume her. She allows herself to remember the humiliating wedding day and finally faces what actually occurred. Some things stay with us just as this story has stayed with me over the years. 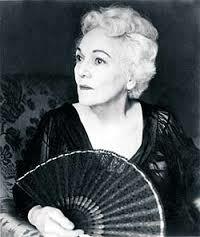 Katherine Anne Porter is another writer that influenced my decision to put pen to paper. I add her to my drumroll of literary greats! She was a Pulitzer Prize winner and is better known for her short stories. She wrote, “A story is like something you wind out of yourself. Like a spider, it is a web you weave, and you love your story like a child.” Thank you for weaving your tales and sharing them with the world, Ms. Porter.